First impressions of Shenyang should be ignored when you arrive in this busy and rather sprawling city, although if you look beyond the traffic problems and modern buildings, it won't take long to be completely drawn in by its charms and tourist appeal. Shenyang contains a true mixture of past and present, with magnificent temples, grand palaces, historic tombs and landscaped botanical gardens, all contrasting with glitz new shopping centres and contemporary high-rise buildings, which tower over the city centre. Located so far north, Shenyang has become an important transport hub for the whole province and offers a great location for those looking to explore north-eastern China. The city boasts an impressive rail network and regular buses, connecting many nearby cities and towns. For more information about Shenyang's extensive transport network, current train and bus timetables and general tourism advice, a trip to the Liaoning Tourism Bureau and China International Travel Service (CITS) on Huanghe Dajie is in order. A rather diverse array of tourist attractions lie within the city of Shenyang, ranging from historic temples and shrines, to modern theme parks and fast rides. 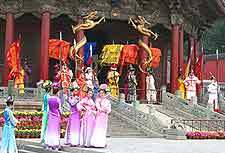 Highlights include Benxi Water Cave National Park - where you are able to take a boat ride through dramatic flooded caves; Zhongshan Square - an important public square in the heart of downtown Shenyang, where the huge statue of Chairman Mao resides; Shenyang Imperial Palace - a striking piece of architecture based on Beijing's Forbidden Palace; Meteorite Mountain Park - where you are able to view the oldest meteorite on the planet; and also the Hunhe Amusement Park - full of family fun, thrilling rides and even an ice skating rink. Those looking to escape the rather animated city life of Shenyang will find plenty of green spaces, with picnic areas, seating and landscaped gardens. The Beiling Park is always popular and features a large boating lake, whereas the Shenyang Botanical Gardens are suitable for horticultural enthusiasts, or simply visitors who enjoy the seasonal displays of flowers. Slightly further afield and home to the Song Dynasty temples, the mountain retreat of Qian Shan National Park is easy to reach and boasts many outstanding historic sites. 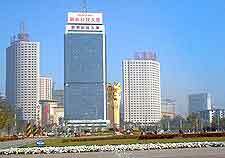 More information about Shenyang Tourist Attractions. Around the city of Shenyang, various landmarks are important reminders of the past and include a number of shrines, temples and pagodas. One of Shenyang's most famous sights is the North Tomb, which stands within Beiling Park and is famous for its elaborate animal statues and traditional Japanese landscaping. Also look out for Shenyang's Northern Pagoda, which is one of the four pagodas that once marked the official boundaries of the city, and the Shengjing Ancient Cultural Street, where many stunning buildings and structures reside, such as the Fujinmen Gate. 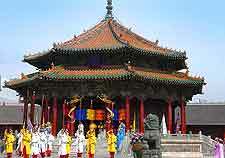 For Buddhists visiting Shenyang, the Ci'en Temple is simply unmissable and dates back to the 7th century. More information about Shenyang Landmarks. Visitors staying in Shenyang and looking for the most cultural of tourist attractions will find the museums and popular art galleries amongst the best offerings. Always worth a visit is the 9.18 Museum, which features a number of exhibitions remembering the invasion of Shenyang in 1931, while the recently opened Liaoning Provincial Museum is home to much more than just dinosaur exhibits. Also of interest, the Pavilion of Ten Kings is located alongside the Imperial Palace and boasts a small museum, with a number of local relics, including Qing weaponry and replicas of banners. 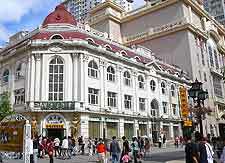 More information about Shenyang Museums. Many outstanding tourist attractions lie outside of the city and if you are planning daytrips and excursions, Shenyang offers a good base. 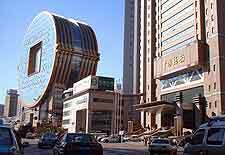 Nearby, the coastal city of Dalian is a firm favourite and features sandy beaches, large parks, aquariums, spacious public squares and major shopping centres, while for others, both the cities of Anshan and Dandon are equally appealing and known for their natural scenery, with the bathing houses and hot springs within Anshan being a firm favourite. 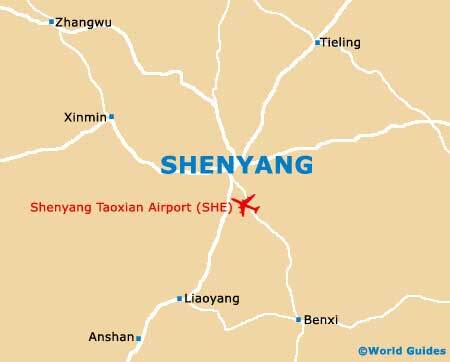 More information about Shenyang Attractions Nearby.